Some people are dreamers, and some are dreamer-doers. Many fans of Edgar Rice Burroughs have dreamed sometimes of ERB books that would contain multiple illustrations -- from the old pulps and from later editions of the books, as well as stunning new art. Jim Gerlach has also dreamed of such things, but Jim is also a doer, and he's done it -- again! 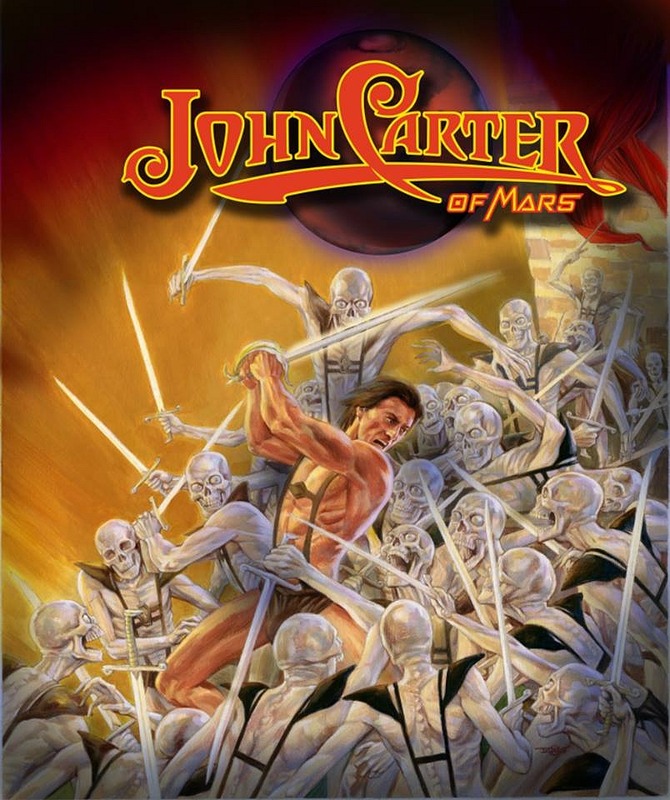 Two new editions of "John Carter of Mars" have just been published and contain the type of art mentioned above, plus much, much more. When I use the word "sets," I mean that Jim Gerlach is selling these books in sets of two. Each set contains the two books, with different bindings, titling and publishers; unique limitation pages, title pages, enclosures and end matter and alternative dust jacket art and layout. 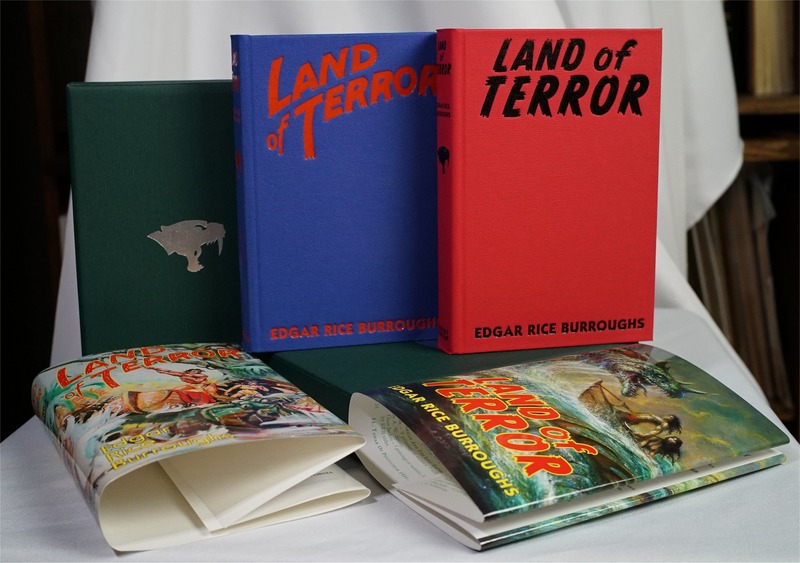 One of the books is an ERB Inc. edition, done with blue binding and similar to that on the books Edgar Rice Burroughs, Inc., published in the latter part of his life. These books have a dust jacket with art by Douglas Klauba, showing John Carter taking on the "Skeleton Men of Jupiter." The other book is a "Grosset & Dunlap" edition, done with traditional red binding, featuring a dust jacket with art by Bob Eggleton showing John Carter about to have an encounter with a white ape. The publication of the ERB Inc. and "Grosset & Dunlap” editions are authorized by agreement with each company, and the G&D edition of "John Carter of Mars" has the distinction of being the 50th ERB title to be published by that company, so that in itself makes it a milestone volume. --The Eggleton art for the jacket of the G&D edition is used as a three-page foldout for the frontispiece of the Burroughs edition. --The cover and spine section of the Klauba art for the jacket of the Burroughs edition is used for the frontispiece of the G&D edition. Both editions are dedicated to Richard A. Lupoff, the editor at Canaveral Books in the early 60s who headed the efforts to bring many of ERB's books back into print in hardbound editions, and to bring some stories out in hardback versions for the very first time. 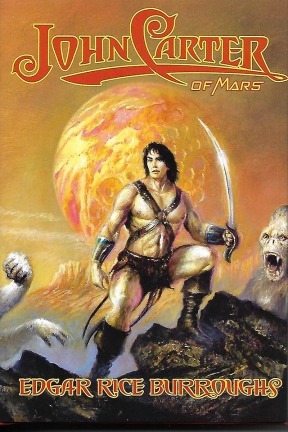 That was when the first hardback edition of the John Carter adventure, "Skeleton Men of Jupiter," appeared in hardback. It was published on July 24, 1964, in the volume titled "John Carter of Mars" along with "John Carter and the Giant of Mars." In that era, many believed that "Giant of Mars" had also been written by ERB. However, it was later established that it had actually been written by ERB's talented son, John Coleman Burroughs, specifically for a Big Little Book. An article by Robert R. Barrett, detailing the detective work that established the son's authorship, is included as an extra in the new volumes published by Gerlach. --Seventy-two of the 207 smaller black and white illustrations made by John Coleman Burroughs for the Big Little Book "John Carter" edition. "Phil Normand colorized eight images in the book... and did an amazing job," said Gerlach. 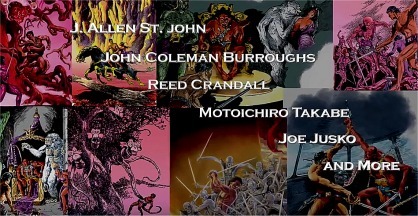 "It included two J. Allen St. John images and six Reed Crandall illustrations." --Foreword by Kevin J Anderson, "Dreaming of Barsoom"
----(G&D edition only) List of ERB G&D reprints at the end of the book as well as a listing of all the various ERB G&D titles and printings on the verso of the dust jacket. --ERB's notebook pages for "Skeleton Men of Jupiter"
--"A Good Place to Quit," by Richard A. Lupoff (originally, Chapter 16 of Lupoff's "Barsoom: ERB and the Martian Vision."  --Bookmark. The die-cut bookmark is double-sided and printed on 160# card stock, with the art reversed on one side to match the die-cut, but different text blocks on each side to promote both the G&D and Burroughs editions. When the books were shipped, the G&D side of the bookmark was placed face-up in the G&D edition, and likewise with the ERB Inc. side up in the Burroughs editions. --(G&D Edition only) A replica copy of a letter that Lupoff, as editor at Canaveral, mailed to fanzine publishers Camille A. Cazedessus Jr. and Vernell Coriell, and to Henry Hardy Heins, author of "A Golden Anniversary Bibliography of Edgar Rice Burroughs" in reference to the coming publication of John Carter of Mars...was included in each ERB Inc. edition. --A medallion/coin with the engraved numbering on the front instead of being engraved on the edge like the first coin to be issued with a Gerlach book, the one that came as a bonus with "Savage Pellucidar. 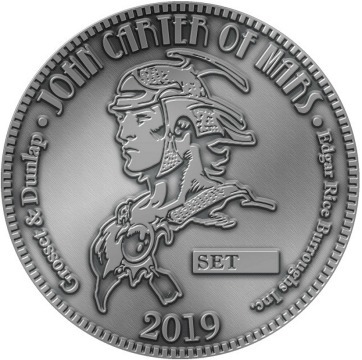 Thomas Grindberg drew the John Carter image that is on the heads side of the coin. One coin was issued per set. --Binding: The G&D binding features the vintage black stamped titles on the cover and spine of the book. The stamping on the blue ERB Inc edition is red/orange as were the originals. Zavier Cabarga designed two different styles of titling for the ERB Inc. and G&D book cover and spine stamp and the title page lettering. 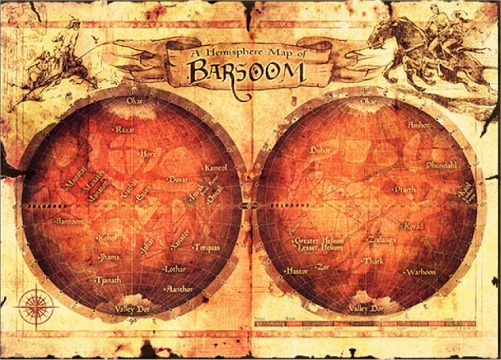 --Endpapers feature a color map of Barsoom. Gerlach designed the map and gave his sketches to an artist in Italy, who digitally rendered them. It was reviewed several times before the final version was ready. --Slipcase for each book. The slipcase for the Numbered Edition is of Cialux cloth and the one for the Lettered Edition is of deluxe bonded leather. --While all G&D editions included a replica postcard explaining the original title misprint (see above), the Lettered Editions actually have replicas of two postcards, written differently and mailed to two different people. --An original sketch opposite the signature page, drawn by the artists when they received the pages to sign. In addition to those remarqued sketches, the artists also signed those pages in addition to the regular signature page. Eggleton added original sketches to the G&D editions and Klauba added original sketches to the Burroughs editions. 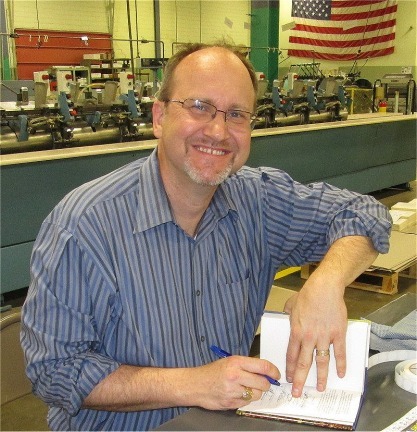 Jim Gerlach started his "ERB Books" publishing several years ago when he came into possession of most of the original printing plates for the first edition of "Back to the Stone Age," plus a more limited number of plates for two other ERB books, "Cave Girl" and "The Chessmen of Mars." Gerlach used the original "Back to the Stone Age" plates to reprint the book in two stunning new editions, an ERB Inc.-style "Publisher's Edition" and a G&D editon. Thanks to the fan acceptance and success of that, he has followed up with similar twin editions of the last two books in ERB's inner-world series, "Land of Terror" and "Savage Pellucidar." Gerlach is pleased that "Interest is growing slowly with each title. We're trying to improve every successive title and add bonus features." Besides the idea for the coins and bookmarks, he added the Canaveral postcards and letter discussed earlier in this article. 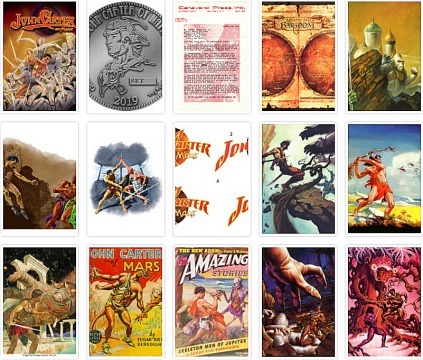 He noted that "John Carter of Mars" has a total of 21 color plates (including the frontispiece), and 88 black and white illustrations on text stock, "by far the most we've ever done. Gerlach was pleased that, though the "John Carter" editions were the most costly set to produce thus far, "yet we managed to not raise the price of either the numbered or lettered sets." --"Back to the Stone Age," the Publisher's Edition, with original bookplate, in clamshell case, was made in 300 editions, 279 of them numbered and 21 lettered. Each lettered volume included a chapter title printing plate and original sketch by Tom Grindberg There was also a G&D Edition published and made available with a choice of two different dust jackets. There were 300 of those. So there were 600 BSA books in total. --"Land of Terror" was 200 numbered and 52 lettered sets, a total of 504 books. --"Savage Pellucidar" included 248 numbered plus 52 lettered sets, for a total of 548 books. --"John Carter of Mars" was 348 numbered and 52 lettered sets, for a total of 800 books. Most of Gerlach's books sell with advance orders, but there are usually some extra sets of the numbered editions available from his website. And a future volume is definitely in the works. Gerlach has announced the next book he plans to publish will be "A Princess of Mars -- The Manuscript Edition."